Having just got back from my trip away, I haven’t had much time this past weekend. I did backup some 5.25 inch floppies I brought back with me, but I was unable to get what I had planned for this week working. Step in Paku Paku which is actually a recently made DOS Pacman clone for the IBM PC. It uses the hacked CGA text mode to get 16 colours on screen at the same time in the same way that Round 42 does. Jason M Knight made it in 2011 as part of something known as the Retrochallenge winter warm-up. You can find his website here. The graphics are very impressive and work on an impressive array of hardware, everything including CGA, EGA, VGA and Tandy/PC jr. Whilst the pixels are larger, the graphics are colourful, nicely animated and move as you’d expect them to. The graphics were programmed with a mix of Turbo Pascal 7 and assembler and Jason has included the source so you can write games/software that has the same graphics capability. There are many different sound devices supported, including the PC speaker, Creative Music System (CMS), Adlib, and a few others. With so many devices to choose from you are sure to have something that will work quite well. I tried both the Adlib and PC speaker for sound and was astonished at how close to the arcade they both sound. The documentation says the CMS probably sounds the best, but I didn’t test this. The controls are as you would expect, simple and easy to use. Turning corners is as you would expect, and the game responds correctly even in tight and fast sections of the maze. The ghost AI actively chases you and runs away at appropriate times, but with quick reflexes they can be outrun and outsmarted. The difficulty curve is not too harsh, and even I managed to get quite a respectable score. 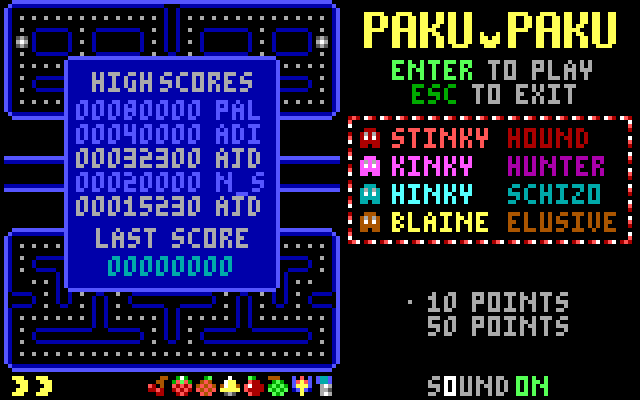 Paku Paku is an impressive game, it fits 16 colour graphics and sound into about 66k of memory, about half being code. It runs incredibly well on old hardware such as the old IBM 5150, XT machines and clones. It’s not just impressive because of its technical features, it’s a well crafted clone of pacman. It’s obvious that great care has gone into the design of the graphics and sound. I’d recommend anyone with a Dos machine (or DosBox) and some time download it and give it a go.